The 2013 rookie class has brought about some hobby hesitation. While there are no sure-thing superstars like last year, several players are establishing themselves. One of them is a wide receiver who's playing for a Houston Texans team that have a lot of potential. 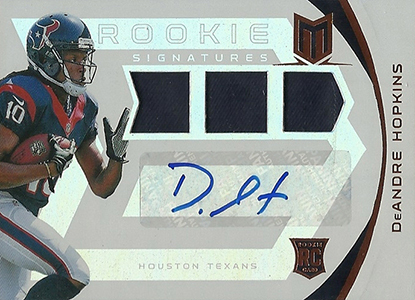 DeAndre Hopkins rookies cards are quickly gathering momentum as he tries to establish himself as a prime target of quarterback Matt Schaub. 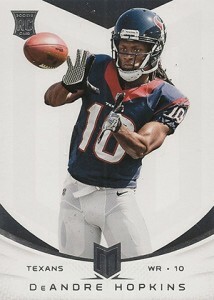 Shop for DeAndre Hopkins cards on eBay. One of the few offensive threats to come out of the first round of the 2013 NFL Draft, Hopkins got off to a fast start. In his second game, versus the Tennessee Titans, the wide receiver came up big when it counted most. He was a key part in the Texans' overtime victory, catching more than 100 yards including a three-yard game-winning touchdown. 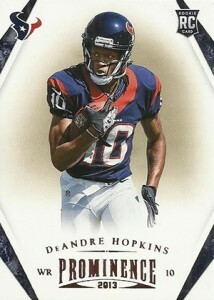 Even as one of the early standouts among fellow 2013 rookies, Hopkins' cards are still affordable. Even most high-end autographs are conservatively priced when you compare them against the cost of boxes they're coming out of. 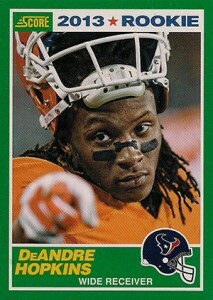 Below is a detailed look at DeAndre Hopkins rookie cards that are available now. 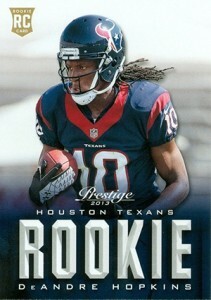 By the time the last 2013 football card sets are released, there will be plenty of DeAndre Hopkins rookie cards to choose from. Below is an ongoing list that will be updated throughout the season as new set are released. Click on the card name or image to shop for singles. 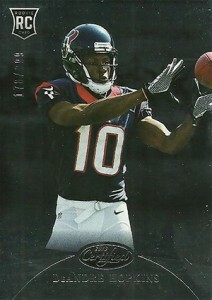 2013 Bowman Football was Topps' first set for the new season. Because it was so early, rookies are pictured in generic uniforms. They were a good way to get collectors excited, however there won't be a lot of long-term value in the base rookie cards from the set. 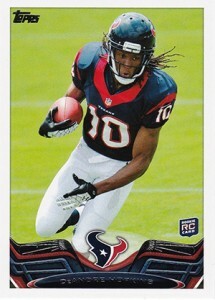 The 2013 Panini Certified DeAndre Hopkins rookie card is part of the New Generation subset. The print run of 999 is on the high side by today's standards so don't expect to have to pay much of a premium. Although not an official rookie card in the traditional sense, there's also an autographed jersey Freshman Fabric card that's numbered as part of the base set. These are much more popular. 2013 Panini Elite Football has a cleaner, brighter look. 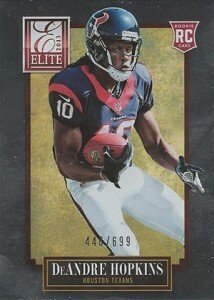 Numbered to 699, the DeAndre Hopkins rookie card doesn't carry a ton of value. It's a decent option for those with a tighter budget and might not want to spend more for an autograph. As a hits-driven product, the base rookie cards in 2013 Panini Momentum are largely overlooked. They have a clean design and are relatively tough to come by. More popular, though, are the Rookie Signatures cards that also come with three jersey swatches. They are numbered as part of the main set but because there's also a regular card in the set, it's not a rookie card in the traditional sense. This is a cheap option for those looking to add a DeAndre Hopkins rookie card to their collection. 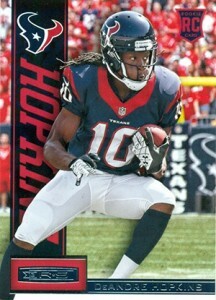 There's also a variation version where Hopkins is pictured in a white jersey. 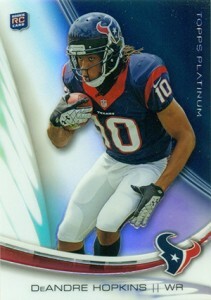 The 2013 Panini Prominence DeAndre Hopkins is similar to Momentum. It has a clean design and isn't numbered, despite coming from a high-end set. Because there are so few base cards per box, this one could prove to be somewhat tough to find over the long-term. That said, it likely won't be reflected much in values as many collectors will opt for rookies with more of a high-end feel. 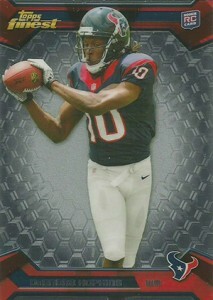 The 2013 Panini Rookies & Stars DeAndre Hopkins is a simple addition that costs little. There's nothing fancy about it. But that's not necessarily a bad thing. From an investment perspective, though, it's doubtful that this one will ever cost much. 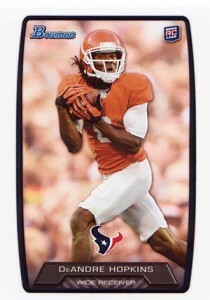 The 2013 Score DeAndre Hopkins rookie card has the distinction of being the first NFL-licensed card on the market. Boasting a design inspired by 1989 Score Football, it has a bit of a retro vibe to it. That said, Score is generally viewed as a low-end set so it will remain on the cheap side. Base Topps is more about tradition and simplicity than delivering high-end rookies. 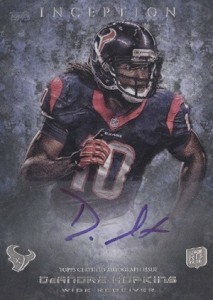 This holds true with the 2013 Topps DeAndre Hopkins. Don't expect to have to fork over more than a dollar or two to land one of these. There's also a rarer variation version that has a different photograph. If you're looking for something that's affordable but feels a little more high-end, the 2013 Topps Finest DeAndre Hopkins rookie card is a good option. Values are higher for rarer Refractor parallels and autographs. 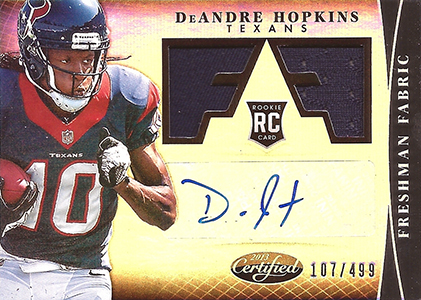 While there's no shortage of DeAndre Hopkins autographs, the 2013 Topps Inception DeAndre Hopkins is the first that's an official rookie card. The design differs very little from previous years, highlighted by a filtered, almost art-like image. Another bonus is the fact that the autograph is on-card and not on a sticker. 2013 Topps Platinum Football has an improved design over previous years. But that hasn't translated into higher values for base rookie cards. Similar to Finest, it has more of an upscale feel but it is very affordable. DeAndre Hopkins also has several other notable cards released by companies that don't have NFL licenses. A few of the highlights are listed below. 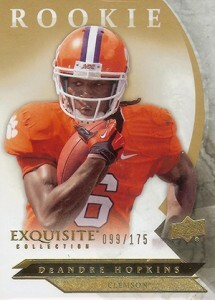 Although a 2012 set by name, 2012 Upper Deck Exquisite was released mid-way through 2013. It focuses primarily on the 2012 rookie class save for a handful of 2013 draft picks. Still, it's the Exquisite name that's the draw here, making this one of the more desirable early DeAndre Hopkins that doesn't have an autograph. Another NCAA offering from Upper Deck, the focal point of the card is the inclusion of an autograph. The jersey piece is large, but it's player-worn and not game-used.